Magnetism and physics are made visible with ferrofluid. Help fund a highly engineered container that showcases this unique material. 341 backers pledged $49,028 to help bring this project to life. Ferrofluid is an extraordinary material with unique ferromagnetic properties. Although dozens of applications for it have been found - from hard drives to loudspeakers - its most impressive is arguably as an interactive display. Ferrofluid displays capture the best qualities of ferrofluid, both as a liquid and as a ferromagnetic substance. By applying magnetic fields of different strengths, different shapes and formations begin to appear in this otherworldly black liquid. By suspending it in a clear liquid, even more interactive qualities are exposed. 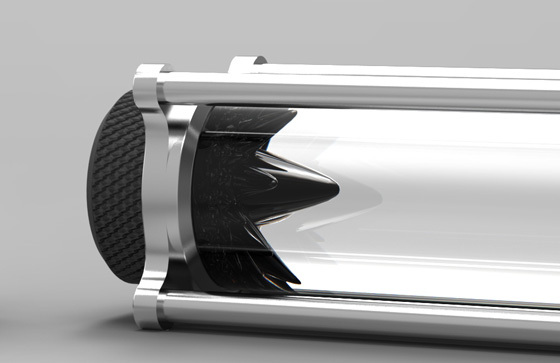 The goal for Ferrite is to create the best ferrofluid display possible. Premium materials like anodized aluminum and high-quality materials are being utilized to create a refined and beautiful product. I also am in the process of finalizing a proprietary superhydrophillic coating to prevent staining. With this, I intend to produce a product that is attractive, usable, and that will survive the test of time. I have designed two products which I have named Ferrite and Ferro. Both have been created to show off the properties of ferrofluid in a safe, visually compelling way. Ferrite has been designed with the desktop use in mind. 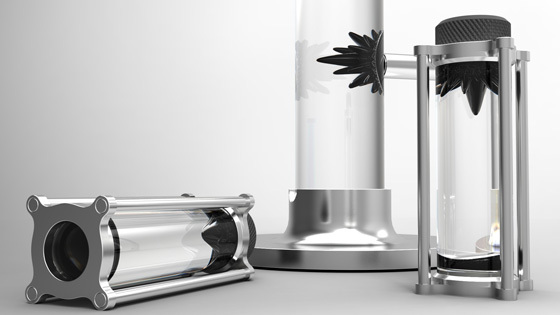 Its design is attractive even when static, and allows for optimal interaction with ferrofluid. The solid aluminum base prevents the display from tipping over, while a matching stylus houses powerful neodymium magnets. A thin layer of rubber on the underside prevents any kind of sliding or slipping while being used. A high-quality enclosure creates a crystal clear view of the fluid, showing off the brilliant and beautiful qualities of ferrofluid. Ferro has been designed as a smaller, more interactive version of Ferrite. It features a cage to protect the container, as well as a special encased magnet that rests on the top of the vessel. 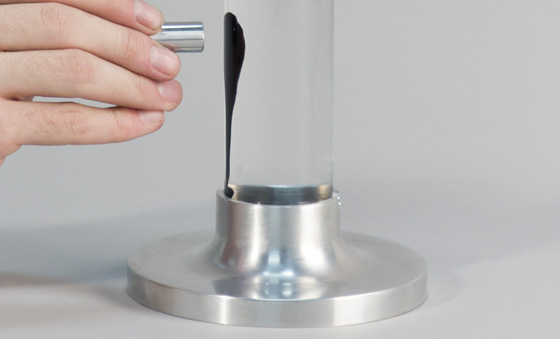 By creating a recessed cavity for the magnet to rest, the ferrofluid is kept consistently in its ferromagnetic state, making it an interesting display piece. Using CNC techniques normally reserved for fine watches, the aluminum cage is a secure and finely crafted piece of hardware. If successful, funding from this project will go towards finalizing the engineering and chemistry to make this product as safe, reliable, and refined as possible. Due to the use of premium materials and expensive processes, final pricing for this initial run has been set at $100 for Ferro and $150 for Ferrite. These prices will include the display, magnets and accessory magnets, and structural packaging to ensure safe shipping. If funding is successful, I hope to have the final product shipping by mid 2012. Assembly will be completed in the US to ensure a high-quality, defect free product. Alongside the products, I have also begun work on a series of desktop backgrounds promoting the project. 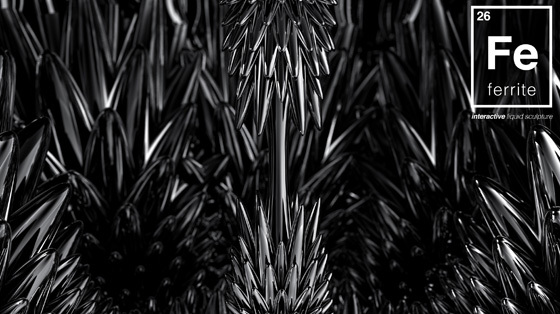 These backgrounds are based on ferrofluid displays and are available in a wide selection of resolutions. These backgrounds are available to all backers who donate $10 or more to the project as a thank you for your support. A example has been included below (Larger version can be viewed at http://davidmark.us/archives/439). A free download of the high-resolution Ferrite backgrounds specially created by the designer. Also receive updates and info about the project including tips about creating your own ferrofluid display! 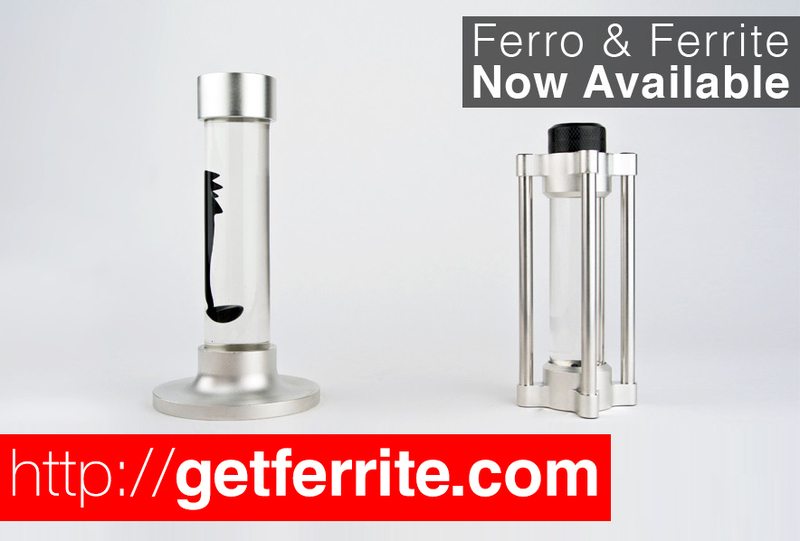 *EARLY BACKER DISCOUNT* One Ferro miniature ferrofluid vessel. Includes one large encased neodymium magnet and one small accessory magnet, shipped in a specially designed protective package. Due to the potentially delicate nature of this product, increased packaging and shipping charges may apply. One Ferro miniature ferrofluid vessel. Includes one large encased neodymium magnet and one small accessory magnet, shipped in a specially designed protective package. Due to the potentially delicate nature of this product, additional packaging and shipping charges may apply. 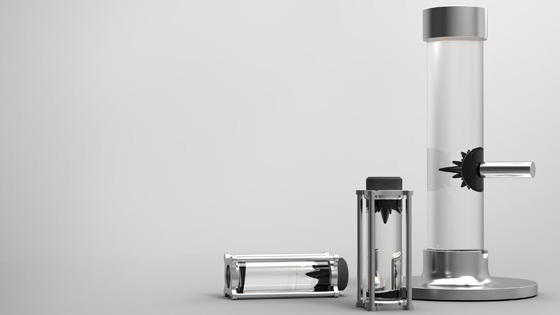 *EARLY BACKER DISCOUNT* One (large) Ferrite ferrofluid vessel. Includes two aluminum magnetic styli and two accessory magnets, shipped in a specially designed protective package. Due to the potentially delicate nature of this product, increased packaging and shipping charges may apply. One (large) Ferrite ferrofluid vessel. Includes two aluminum magnetic styli and two accessory magnets, shipped in a specially designed protective package. Due to the potentially delicate nature of this product, additional packaging and shipping charges may apply. *BEST EARLY BACKER DISCOUNT* Ferro and Ferrite combo pack! Early backers get both at a discounted price! Includes the standard sets listed in the basic reward levels. Includes the combo pack of both Ferro and Ferrite that have been hand signed by the designer, as well as a poster-sized print of an originally ferrite rendering, printed and signed by the artist. Also includes extra magnets and a specially designed stylus.